Well, here we are at the end of another term (where does the time go?). 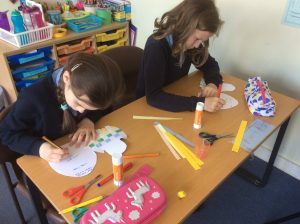 After a lovely Easter assembly this morning where we listened to the Easter story from Emma (Lickey Church), we have been busy making our Easter cards. We had to practice our listening skills in order to carefully follow each step; some us learned the new skill of weaving (‘over, under, over, under‘ and then ‘under, over, under, over…). Also, one of our Year 4 children gained his penmanship licence today. It was a real pleasure seeing the unexpected surprise on his face when he received his handwriting pen. He was able to use it to write in his Easter card. For Fresh Fruit Friday we tried fig. Some liked it and some disliked the crunchy texture; at least everyone tried it. Please have a happy and safe Easter holiday – I hope the weather is kind so that we can all spend some time out of doors. 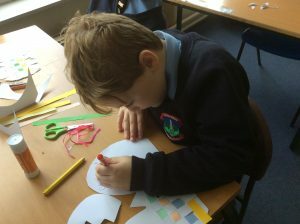 I will hopefully be back sometime to see how our children are getting on…maybe in the summer term. Love from Mrs Jones. It’s Minpin week on the Great British Sewing Bee! Hearing & Smelling & Feeling & Seeing is believing!